Just a short post today. I have expressed my love for Kaffe 1668 before but it must be reiterated. Now that I no longer work a block away from this place, I miss it sorely. I don't think there are any single-brewed-cup places near me now. Plus, everywhere I turn my head in this place, I see a lovely photo waiting to be captured, even in the dying late afternoon light. Kaffe 1668, can I take you to Midtown with me, please? Macbook, lattes, NYT, sounds like a perfect combination! The closes coffee shop near my work is Starbucks. Good thing I like their coffee! PS: Did you get a new job? I am in love your blog! Such a pleasure to read and look through. Cheers to you and good luck! These images are making my heart smile! 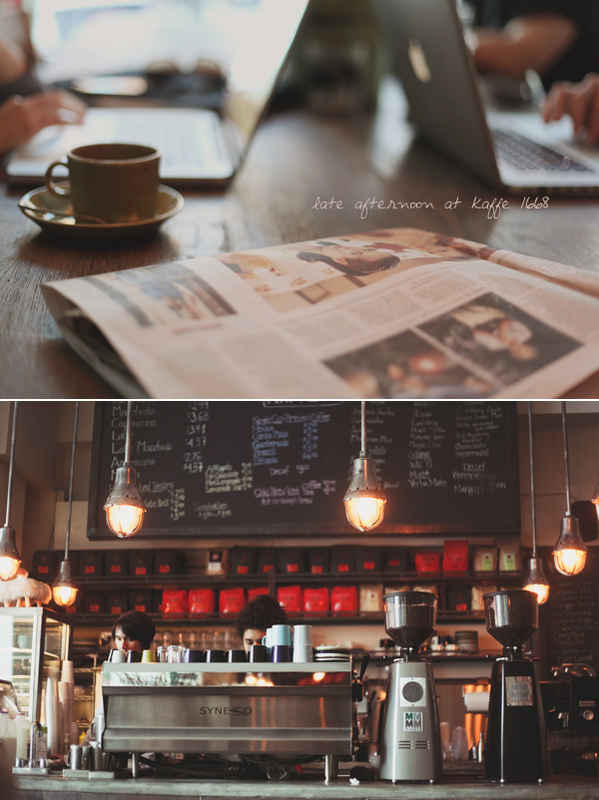 I love the top photograph of coffee, laptops and the newspaper... it's perfect! Sorry to spam your blog with all my comments but like everyone else who commented, I too am in love with your blog! Thanks for sharing your words & pictures!